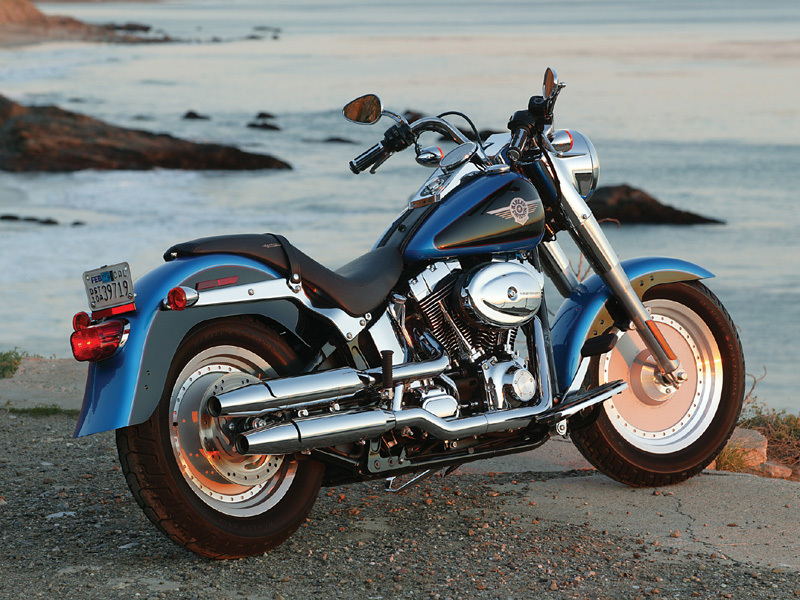 Harley Davidson Fat Boy is class looking hefty bike built on Softail design is known for the comfort it provides. Read this review to find out its features, specifications and price in India. Boosted by a 1690 cc engine Fat Boy is a soft tail motorcycle from the Harley Davidson inventory. The low height, wide handled, lengthy cruise can blow off any road by its appearance and simply the power. The comfort from the throne like seating position coupled with some informative instrumentation and ergonomics of the Fat Boy would make the riding experience a desirable one. The bullet holed disc wheels can also be mirror polished to give a glossy look. They also have the optional advantage of adding the Anti Lock Braking system. The fineness of the hand finished petrol tanks is given a classy look by leather straps and the brand name in chrome on its side is like a crown to the ride. Harley Davidson Fat Boy has a 1690 cc twin cylinder air cooled V engine at its heart. The twin cam 103 in the engine type indicates that the engine has a volume of 103 cubic inch. The twin cylinders use an injector for fuel injection which actuate sequentially at each cylinder and this actuation timing is controlled by and electronic unit. This Electronic Sequential Port Fuel Injection system provides better response to throttle movement. The light weight pistons of these engines give an efficient output of power. These engines are designed to provide high torque at lower rpm therefore the rider would not need much effort to cruise over any inclination of road at low speeds. The engine delivers a torque of 132 Nm at 3250 rpm. This is an indication to the kind of power this huge engine can generate. Harley Davidson Fat Boy designed with a laid back posture of the rider is run by a pair of wide wheels on front and rear. Both the front and rear wheels have an aluminum cast bulleted disc. The fork cover, the head lamp assembly, the wide handle bar, the brake lever and the tiny rear view give a classic look to the bike from the front. 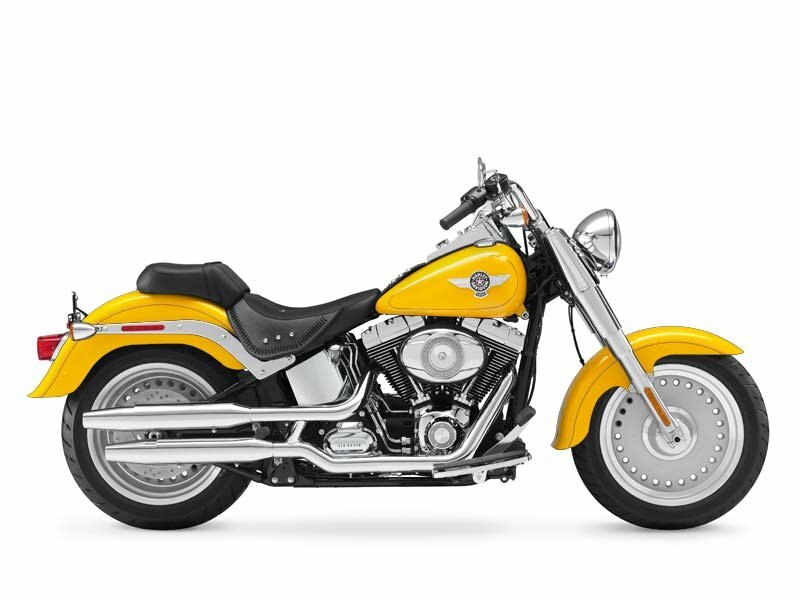 Chrome coated engine assembly, the transmission and the exhaust is simply an irresistibly adorable unit of the fat boy. The low seat height with a board for foot rest offset to the front gives a comfortable riding posture. The 1690 cc engine’s power is delivered to a pair of wide wheels through a 6 speed transmission system. Dunlop tyres of 140 mm and 200 mm width on front and rear respectively have radial cords and give better control of a high torque ride. The tyres are designed with high load carrying capability and they can sustain speed of around 240 kms/hr. Disc brakes are active by four piston calipers on the front and two piston caliper braking system on the rear. Horizontally mounted coil springs connected to the swing arm are hidden rear suspensions of the fat boy. The rear suspension along with the 42 mm telescopic suspension on the front ensures better handling of the bike. The bike can run about 15 to 22 kms per litre of petrol depending on the riding conditions and road conditions. 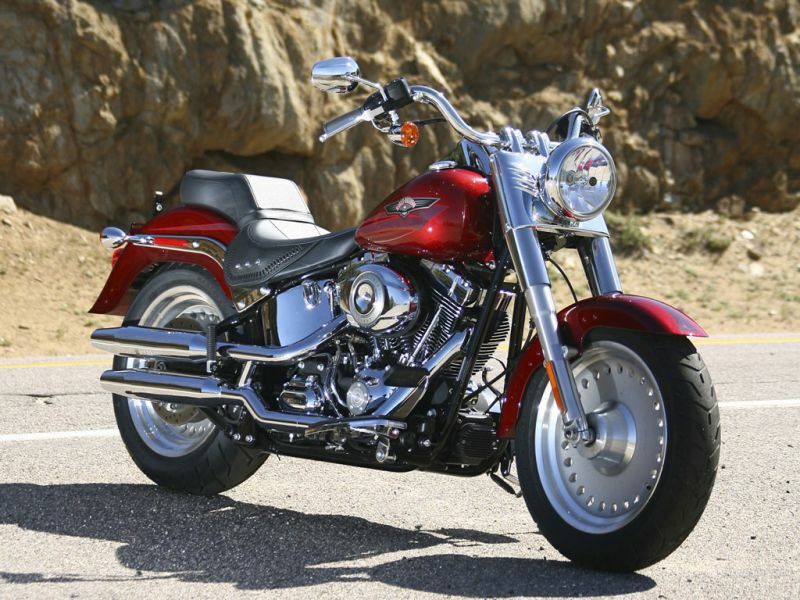 Harley Davidson has made some changes in the outlook of Fat Boy and has released another model named Fat Boy Special. Other technical features of this model remain almost same to the basic model. The Harley Davidson Fat Boy would cost around Rs 19,45,000 in New Delhi.